I believe that through cultural experiences of the arts, we are able to make sense of the world and ourselves, either by producing works or viewing and interacting with them. This has been the case throughout history. Because art responds to individual and cultural needs it provides a gateway to knowledge. Educating through art may be approached through a combination of the following methods: Expressionist, Reconstructivist, and Scientific Rationalist. I do not necessarily see these as conflicting models but instead, I feel that they are individual streams that have the potential to intertwine and compliment each other as a unified educational approach. The expressionistic approach (art for art’s sake) honors the child’s innate potential for creativity and imagination and strives to protect, nurture and foster development while respecting the child’s autonomy. The Reconstructivist lens of art education (art is a means to an end other that art) recognizes the potential for art education as being a powerful tool for historical and moral guidance, which fosters critical thinking capacities by providing a rich environment in which to exercise theoretical and analytical practices providing possibilities for social change. Scientific rationalism (learning to reason through observation and perception) employs an inquiry-based approach to learning. This method considers both philosophical and psychological matters pertaining to art as contributing factors in cognition. Art then, is the means to both intellectual and human development. As an educator, I feel that all three of these streams are equitably valid and offer truly meaningful educational experiences through art, leading to the intellectual, social, and cultural development of an individual. "Real World Learning" for Today! Sample Lessons from Elementary, Middle, and High School. For more lessons visit In the Art Room. Students learned how to make monoprints using miscellaneous tools for mark marking and the table as a printing plate. Monoprinting is a process whereby only one print is pulled from the printing plate. This can be modified for any grade level or ability. Materials:Tempera paint (squirt bottles), mark making tools (purchased or found), table (used as the printmaking plate), masking tape (to section off printing surface), large format printmaking paper of finger painting paper. Experience a variety of mark making techniques. Learning the concept of monoprint-monotype (one print from a plate). Learn about reverse imagery through the experience of printmaking. Fourth/Fifth Grade Printmaking on the table with tempera paint and mark making tools. Sixth graders were introduced to both traditional and contemporary Navajo weaving and weavers. We explored both the similarities between the contemporary and traditional styles as well as how they have changed within the Navajo culture. 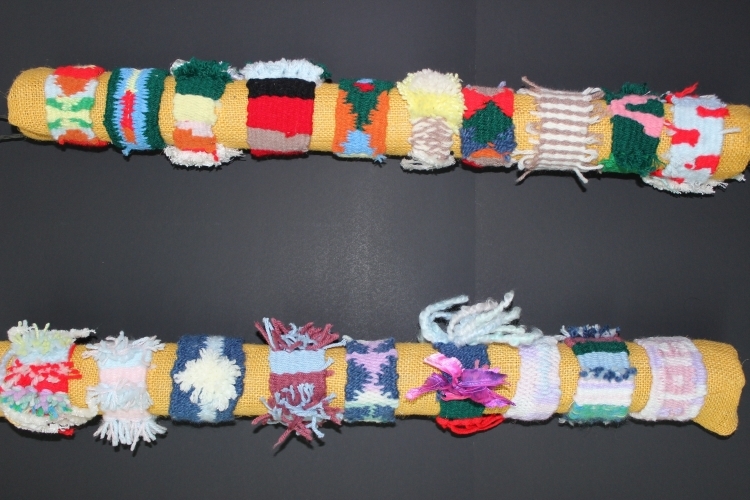 The students created these bracelets with color, pattern, and texture on a cardboard loom with yarn. Considerations included color scheme, symmetry, symbolism and personal identity. Sixth grade wristband weaving projects. Students will work together in selected groups of four to create a large format wood cut print incorporating the Tunisian Collaborative Painting technique. Tunisian Collaborative Painting (TCP) requires groups of artists to apply a set of rules that result in a cohesive painting with the appearance of a sole artistic presence. The painters work in silence for an allotted period, and there is no preconceived subject The concept behind Tunisian Collaborative Painting is simple, yet profound. It celebrates the oneness of all human beings and the wonder of the creative process. As a group of four they will decide how they will approach the work in regards to design, technique, process and operations. Each group will complete a 4 x 4 foot wood cut carved out of plywood. Students will pull four canvas prints (one for each student). Student may choose to make individual prints on 8 x 8 “ abstracted area of the work on canvas or various printmaking papers. This lesson was modified from the Tunisian Collaborative Painting method and could be presented as such. VA: Cr1.1.8a Document early stages of the creative process visually and/or verbally in traditional or new media. Collaboratively develop a proposal for an installation, artwork, or space design that transforms the perception and experience of a particular place. Materials Needed: 4 x4 ‘ cuts of Plywood, wood burning tools, cabinet maker carving tool, canvas on the roll, a variety of block printing ink and paper, a variety of pressing tools (be resourceful). • The participation of at least three artists with a maximum of seven. • There is no preconceived subject. • One artist starts the painting. • Anyone can paint at any time and anyone can paint over anyone else’s work. • If an artist thinks the painting is finished he raises his hand and the arbiter takes a vote; only a majority of the artists can declare a painting finished. • A painting can take a maximum of three hours. • The painting is created in silence. Upon completion of the assignment students will submit a final paragraph synthesizing their reflective experience of this working process. Students will grade themselves using a rubric and answer questions about the art process and turn them in along with their final project. Painting from a modification of this lesson plan. Courtesy of B. Brown.